Have you ever wanted to get yourself an app or a game from Google Play Store and end up with nothing since your device is not compatible with the app? Or have you wanted an application so bad but you can’t download it directly from your device. Fortunately for you, my beloved Android Fan Club readers, there is a way to download the APK of your most wanted apps and games from Google Play Store directly to your PC. Yes! it is really possible by using the APK downloader. 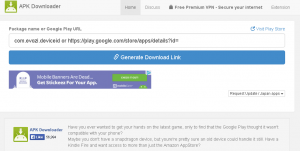 What is Online APK Downloader? Online APK downloader allow users to download the apk file of a certain app or game just by providing the URL or ID from Google Play Store. The browser will download the apk file and save it to the the local drive of the computer. Prior to Online APK Downloader method, I had shared the method to Extract APK Files from Google Play Store using APK Leecher. How to use APK Downloader? The first thing you need to do is to go this site. After that, you will be presented with a page similar to this. After having a page like this, you will then need the URL or ID of app or game from Google Play Store that needs to be downloaded. Copy the URL and paste it to the text box provided in APK downloader page. After posting the URL, click the generate download link button so the page will be able to confirm if the URL is valid and if there is an apk file inside that URL. If the APK downloader confirmed that the URL is valid, a green download button will appear. Click it to start downloading your apk file. The best thing about APK Downloader is you can use it for FREE! Yes, you can download all the applications and games you want without paying any dime for it! But of course, they are accepting donations so they can improve their services even better. You can only download Freeware apps this way.